Saturday, April 5, 6-9 p.m.
Photo Courtesy of the Artist. Jeff Jordan's dreamy, absurdist "Crossroads" is part of the "Laughter in Darkness" show at HSU's First Street Gallery. Photo Courtesy of the Artist. 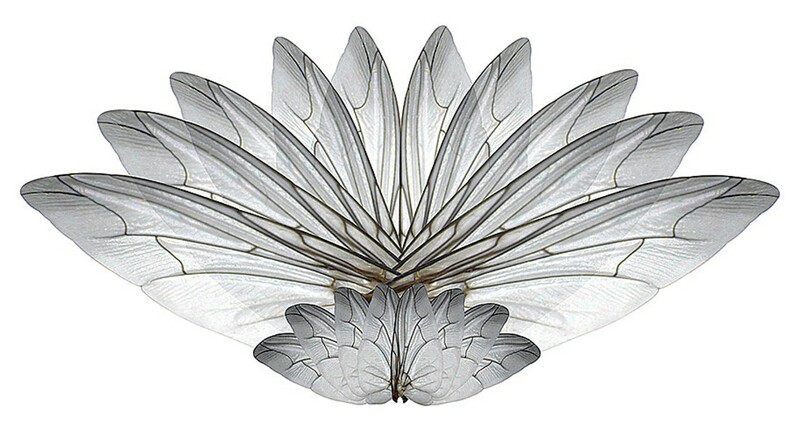 See Gail Wight's "Nuphar volatilis" in "The Spider and the Fly" show at First Street Gallery. The artist explores patterns and perceptions in the natural world, as well as the webs of drugged spiders. Photo Courtesy of the Artist. Isabelle Staehle, who works on the floor and finishes her pieces in one sitting, says, "The round format came spontaneously to me, as if I was drawing on a drum." See her pastels at the Blackfaun Gallery. 2. HUMBOLDT ARTS COUNCIL at the Morris Graves Museum of Art, 636 F St. Performance Rotunda: Music by the Compost Mountain Boys, bluegrass. 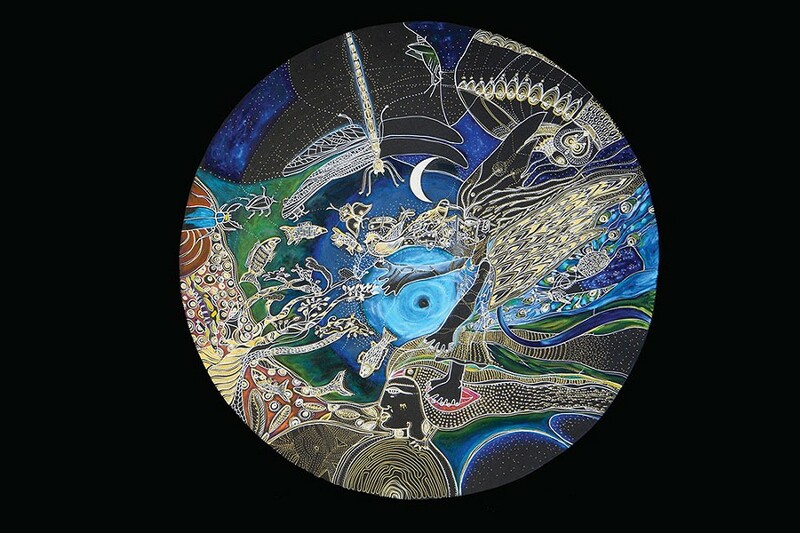 William Thonson Gallery: "The Inversion of the Worlds/ L'inversion des mondes," Michael Martineau. 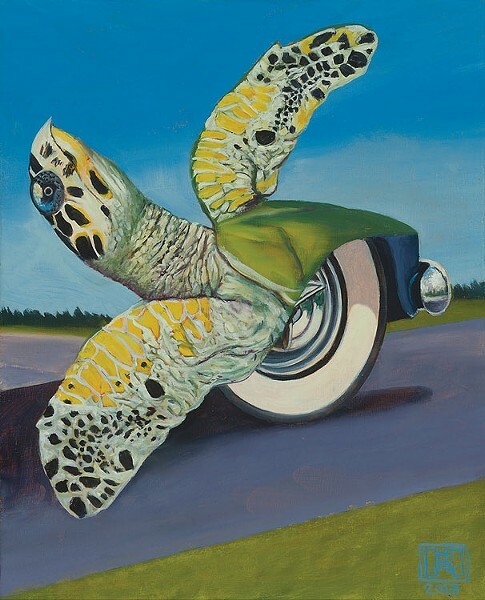 Homer Balabanis Gallery: Humboldt Artist Gallery featuring representational and abstract paintings, prints, jewelry, photographs and ceramics. Anderson Gallery: "Dividing Time," Christopher Troutman, drawings. Knight Gallery: "The Great Act of Disappearing," Jessica McCambly. Youth Gallery: "Fractured Fairytales," Papel Picado pieces by students. 3. EUREKA THEATER 612 F St. Cartoons and popcorn. 4. REDWOOD ART ASSOCIATION 603 F St. "Human Emotions," association member show. 5. MEGARA'S SALON 521 Sixth St. Portia Jett, artist. 6. DALIANES 522 F St. Claudia Lima, oils on canvas. Music by Bradley Dean. 7. F ST. FOTO GALLERY at Swanlund's Camera, 527 F St. Digital photo work by Arcata Arts Institute students. 7a. THE LOCAL 517 F St. "Sunsets," Ray McMillin, photography. 7b. REDWOOD MUSIC MART 511 F St. Ukulele players. Come down and play. 8. SACRED PALACE BIKRAM YOGA 516 Fifth St. "Shadow Puppet Stories From Around The World" with Sean. Cora Bird, drawings. 8a. 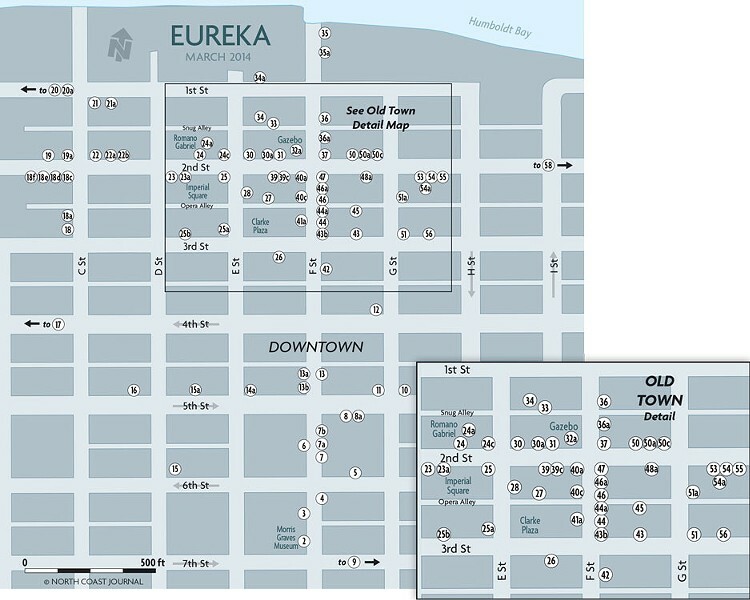 EUREKA STUDIO ARTS 526 Fifth St. Stock Schlueter, plein air paintings. Painting demos by the artist. 9. MIKKIMOVES' LIVING ROOM GALLERY 805 Seventh St. "Northern California Views," Ginny Dexter, photography. Anita Tavernier, paintings. Music by the Lisa Baney Trio. 11. BOLLYWOOD INDIAN CUISINE 535 Fifth St. Chrissy Fracker, portraits. Belly dance performance. 12. HUMBOLDT REPUBLIC 535 Fourth St. Jason Brandy, canvases. Music TBA. 13. SEWELL GALLERY FINE ART 423 F St. "Women and Places," Alicia Tredway, oil paintings. Connie Butler, paper prints and ceramic vessels. Music by Doug Felden and 4/4 Jazz. Beverage service benefits Friends of the Dunes. 13a. NORTH COAST DANCE 426 F St. '80s dance benefiting Relay for Life. Live music. 13b. BLACK LIGHTNING MOTORCYCLE CAFÉ 440 F St. Stephen Brisken, photography. Wild banshee flapper music by Canary and the Vamp. 14a. SIDEWALK GALLERY at Ellis Art and Engineering, 401 Fifth St. Natalia Burke, artwork. 15. COLLEGE OF THE REDWOODS COMMUNITY EDUCATION 525 D St. Carol Telesky, botanical watercolors. 15a. AMIGAS BURRITOS 317 Fifth St. Mary Ann Renner, artwork. "Ocean Scenes," Vince Cavataio, photography. 17. NORTH COAST CO-OP 25 Fourth St. Seth Strope, oil and acrylic paintings. 18. CHERI BLACKERBY GALLERY and THE STUDIO 272 C St. "New Landscapes," Gary Cheadle, Mike Hedlund, Pablo Rahner and Jim Wilson. 18a. C STREET STUDIOS & HALL GALLERY 208 C St. Bob Doran, photographs. 18c. SAILORS' GRAVE TATTOO 138 Second St. Tattoo related art, antiques and memorabilia. 18d. LIVELLA RECORDING STUDIO 120 Second St., Ste. B Music by Sets Revenge, electronica. 8-10 p.m.
18e. MANTOVA'S TWO ST. MUSIC 124 Second St. Music by Craig and Chuck. 18f. THE BLACKFAUN GALLERY 120 Second St. "from exile in the light," Isabelle Staehl, pastel on panel. Daniel Frachon, ceramic sculpture. 19. SWEET SEA STUDIO, 129 Second St. Digital photographs. 20. WHARFINGER BUILDING 1 Marina Way. Richard Salas, underwater photography lecture/slideshow 5:30-7 p.m., $16, $13 seniors, kids and students. Benefit for the museum. 20a. BAR FLY PUB AND GRUB 91 Commercial St. Marni Schneider. Art from Kathleen Bryson's private collection. DJ Music at 9 p.m.
21. STEVE AND DAVE'S First and C Streets. Marni Schneider, photographs. 21a. REDWOOD CURTAIN 220 First St. Lobby Gallery: Red and Nancy Jioras, jewelry, shadow boxes. 22. CHAPALA CAFE 201 Second St. Kylan Luken, photographs. 22a. ACCENT GALLERY 219 Second St. Acoustic music by The Man In White. 22b. GOOD RELATIONS 223 Second St. Cheri Esparza, photographs. 23. HUMBOLDT HERBALS 300 Second St. Araya Smelser (age 11), watercolors. Music by Magdeline. 23a. FOREVER YOUNG BEAUTY SALON 308 Second St. Brittany McBroome, paintings on skateboard decks. Anniversary celebration giveaways. 24. THE SIREN'S SONG TAVERN 325 Second St., Suite 102. Seth Smith, artwork. Music by The Hip Joints. 24a. BRENDA TUXFORD GALLERY 325 Second St. "Hungry Ghosts: Pan Asian and Pacific Islander Perspectives," group show. 24c. RUSTIC WEST TRADING CO. 339 Second St. Casey Smith, vintage jewelry. Eric Simon, photographs. Millie Quam, jewelry. Glenda Noel, pottery. 25. CIARA'S IRISH SHOP 334 Second St. Julia Bednar, Michelle Murphy-Ferguson and Delores Terry, artwork. 25a. CLARKE HISTORICAL MUSEUM 240 E St. Phyllis Reynolds, photographs. Signing by Night Crossings and Falk's Claim author Jon Humboldt Gates. 25b. CALIFORNIA MENTOR 317 Third St. "Petals and Portraits," Geraldine Sadler, acrylic paintings. 26. SHIPWRECK 430 Third St. "A Place of Dwelling," Jannarie Ricchio, paintings. 27. CAFÉ NOONER 409 Opera Alley. Guy Fieri tribute by local artists. Music by John Myers and Jim Silva, acoustic. 28. RAMONE'S 209 E St. Helena Williams, acrylic paintings. Music by Soulful Sidekicks, folk. 30. TRUCHAS GALLERY/LOS BAGELS 403 Second St. 30th Anniversary Kids Coloring Contest. 30a. BELLE STARR 405 Second St. Photographs. 31. NORTH SOLES 407 Second St. Susan Genell Schuessler, paintings and silverpoint drawings. 32a. OLD TOWN SQUARE Second and F streets. Music TBA. 33. CORNUCOPIA 425 Snug Alley. Music by Kathe Lyth on harp and the Alumni Singers. 34. HSU FIRST ST. GALLERY 422 First St. "The Spider and the Fly," Gail Wight, prints and mixed media drawings. "Laughter in Darkness," Seana Burden, Jeff Jordan and Jesse Wiedel, paintings. 34a. WHIPLASH CURVE JEWELER 423 First St. Dusseau Designs, jewelry. 35. BAYFRONT RESTAURANT 1 F St. Richard Duning, paintings. 35a. LIVING THE DREAM ICE CREAM 1 F St. Jessica Albee, artwork. 36. VANITY 109 F St. Blake Reagan, mixed media. 36a. STRICTLY FOR THE BIRDS 123 F St. "Art Depicting the Natural World," Louise Ogden-Bacon. 37. LINEN CLOSET 127 F St. Casey Smith, jewelry. 39. THE LITTLE SHOP OF HERS 416 Second St. Sammy Harmon, drawings. 39c. EUREKA BOOKS 426 Second St. Broadsides of poems by Amy Uyeki, Jerry Martien, Gary Snyder, Jim Dodge, Margaret Atwood, Charles Bukowski and Thich Nhat Hanh. 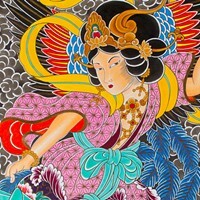 Talk and signing by Amy Uyeki, illustrator of Sanae, Senryu Poet: Her Life in 5-7-5. 40a. MANY HANDS GALLERY 438 Second St. Jorden Goodspeed and Crystal Thorpe, artwork. 40c. TALISMAN BEADS 214 F St. Performance by Tribal Oasis Belly Dancing. 41a. THE WINE SPOT 234 F St. Michael Hayes' students' artwork. 42. OLD TOWN JEWELERS 311 F St. Pat Durbin, art quilts. 43. COCO & CUVEE 531 Third St. Bob Doran, photographs. 44. AMERICAN INDIAN ART GALLERY 241 F St. Dawn Woodman, artwork. 44a. OLD TOWN ART GALLERY 233 F St. Natasha and David Breen, Photoshop watercolors. 45. HUMBOLDT BAY COFFEE 526 Opera Alley. Sheik, live painting. Performance by Samba da Alegria dancers. 46. FUNK SHUI 213 F St. "Slice of Humboldt Pie" baked goods by Amber. 46a. OLD TOWN COFFEE and CHOCOLATES 211 F St. Work by Zane Middle School art students. Music by Lizzy and the Moonbeams. 47. OLD TOWN ANTIQUE LIGHTING Second and F streets. "Art Reflections of Humboldt," Donna and Bob Sellers, mixed media and acrylic paintings. 48a. ST. VINCENT DE PAUL 528 Second St. Wooden egg painting in partnership with Humboldt Hardware. Happy Memories photo booth. 50. WOLF DAWG 525 Second St. Teresa Whitehawk, artwork. Music by John David Young Conspiracy. Les Craig's birthday celebration. 50a. MEDICAL STAFFING NETWORK 527 Second St. Cheryl Kelly and friends, artwork and music. 50c. HUMBOLDT HARDWARE 531 Second St. John Gordon Sr., wood craft. Wooden egg painting in partnership with St. Vincent de Paul. 51. PRAXIS FITNESS 239 G St. Courtney Ann Slider, photographs. 51a. Parasol arts 211 G St. Music by Brian Post and Susie Loraine, jazz. 53. ORANGE CUP CORAL SALON 612 Second St. Rob Hampson, oils. Jane Cooper, leather accessories. 54. PIANTE 620 Second St. Sondra Schwetman and Patrick Williams, Metal Pin Cushion, installations. 56. ORIGIN DESIGN LAB 621 Third St. Sewing machine window display. 58. ADORNI CENTER 1011 Waterfront St. Rosalie Thomson, mixed media, watercolor and acrylic. Kayla Arielle, photographs. Humboldt Open Air Watercolor Painters: Jim McVicker, Steve Porter, Jody Bryan and Paul Rickar.